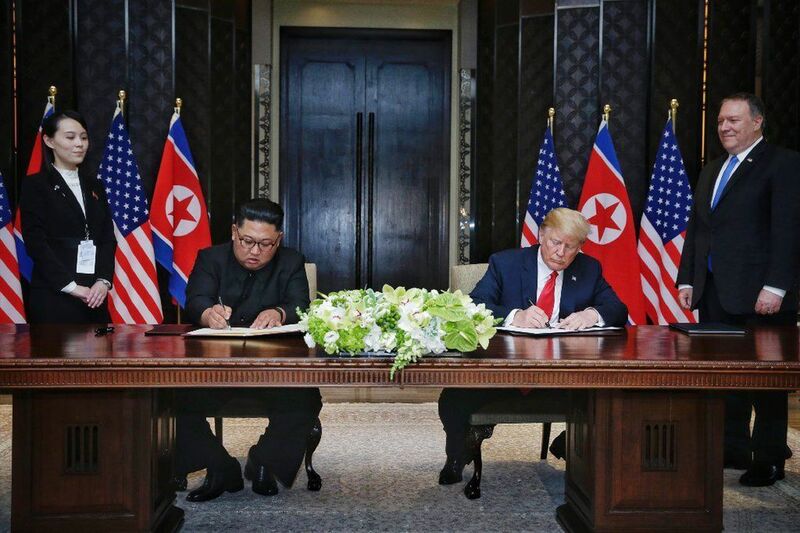 VietPress USA (June 12, 2018): Watch the following Videos that show the signing "comprehensive document" between U.S. President Donald Trump and North Korean Leader Kim Jong-un at the Summit in Singapore on June 12, 2018; and the press conference by Trump before 2,500 reporters worldwide after Kim Jong-un left Singapore. The air in Singapore was thick with humidity — and the atmosphere with skepticism — as President Trump and North Korean Leader Kim Jong Un ended their historic meeting on Tuesday. “I think better than anybody could have expected. Top of the line. Really good. We’re going right now for a signing,” Trump said. The 2,500 journalists covering the event erupted with questions. “Has he agreed to give up any nuclear weapons?” one asked of Kim. “What are you signing?” asked another. Trump ignored those questions; if he was hoping that the joint statement he and Kim unveiled a few hours later would appease the curiosity of the world, he would be disappointed. That statement promised “complete denuclearization of the Korean Peninsula” and “new relations” between the two countries without detailing anything about what that might entail or how these lofty goals will be achieved. While the joint statement praised the meeting as “an epochal event of great significance,” and Trump allies credited the president with a diplomatic masterstroke, some experts on the volatile region had clear misgivings the summit didn’t yield more substantive results. North Korea’s promise to eliminate its nuclear arsenal did not include a commitment to verifiable, irreversible denuclearization — the standard enunciated by Secretary of State Mike Pompeo before the meeting — nor any explicit agreements on exactly what would be destroyed and how the process could be monitored. 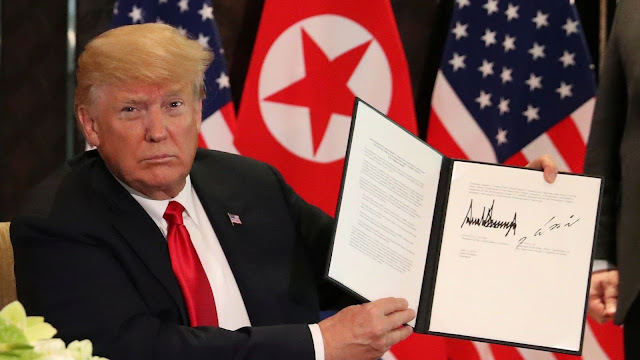 Speaking on CNN shortly after the agreement was unveiled, Joseph Yun, who served as the United States Special Representative for North Korea Policy during the first fourteen months of Trump’s administration, said he was “disappointed” in the results of the talks. “No not at all. Because if you look at it, I mean it said we are going to … let’s see here,” Trump began before pulling out a copy of the joint statement and searching for a line to prove his point. As he spoke to the press, Trump lavished praise on Kim, a stark contrast to his excoriation of Canadian Prime Minister Justin Trudeau after the G-7 summit in Quebec. He thanked Kim “for taking the first bold step toward a bright new future” towards denuclearization and, ultimately, a lasting peace. “I think he wants to get it done,” Trump said. “I really feel that very strongly.” The days when Trump taunted Kim as “Little Rocket Man” on Twitter, while Kim answered by calling him “a mentally deranged U.S. dotard” seemed to belong to another world, replaced by images of the two men sitting together and strolling side by side. Trump even invited Kim to peek inside his presidential limousine, in perhaps the most lighthearted moment in this unlikely meeting between nuclear powers. Trump also faced questions about North Korea’s dismal human rights record and whether his summit with Kim gave a despotic the legitimization it craved in exchange for too little. Under Kim’s father, Kim Jong Il, North Korea’s brutal repression of its own citizens, combined with a growing anti-American bellicosity, led George W. Bush to label it a part of the “axis of evil” of rogue nations around the world. The president acknowledged the situation in North Korea is “rough,” but said eliminating the country’s weapons of mass destruction was his top priority. Human rights were “discussed relatively briefly compared to denuclearization” during his sitdown with Kim, disappointing some observers. For now, nuclear weapons remain the top priority. North Korea has intercontinental ballistic missiles capable of reaching the American mainland, though whether they could carry a nuclear payload remains a matter of debate.The country has technically remained at war with the U.S. since the Korean War ended in 1953, with an armistice rather than a formal peace treaty. Trump’s Singapore summit didn’t change that status quo, but the joint statement included a provision “reaffirming” a promise Kim made last month to work with South Korea to end that longstanding conflict. In his remarks following the talks, Trump vowed the war would “soon end” despite no agreement having been reached on that issue. And Trump indicated there were promises with Kim that weren’t confined to the agreement signed by the two leaders. According to the president, North Korea has already agreed to destroy a military facility. For his part, Trump said he was not yet prepared to withdraw the approximately 30,000 U.S. troops stationed in South Korea, but he committed to stopping the annual military exercises with South Korea that North Korea has long seen as a threat. While there may be doubts about the substance of Trump’s summit with Kim, there can be no questioning the style. A showman unlike any other on the stage of global diplomacy, Trump has previously delighted in the “ratings” generated by his dealings with North Korea. 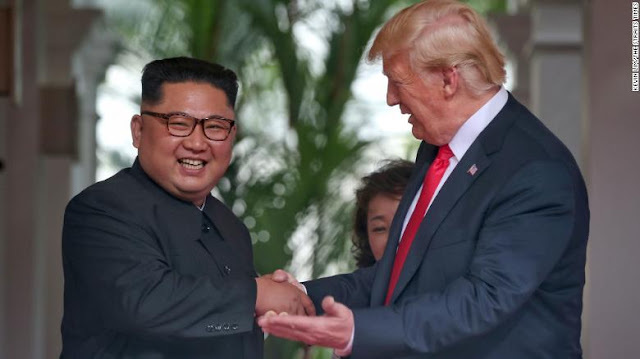 The Singapore summit was Trump’s biggest spectacle yet with, punctuated by the former professional basketball player Dennis Rodman descending on the tropical setting to witness the astonishing event. 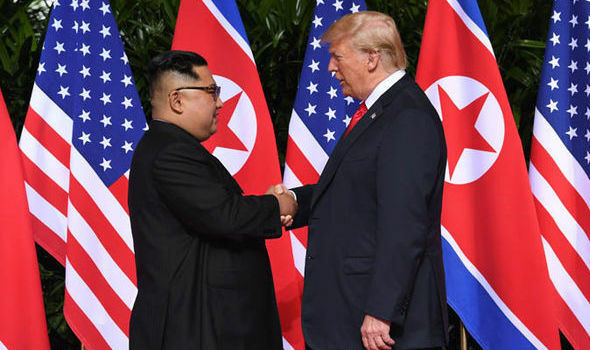 According to the White House press pool, during his chats with Trump, Kim was overheard by reporters marveling to Trump about how stunned the world would be to see America’s celebrity president alongside the world’s most infamous dictator. “Many people in the world will think of this as a … form of fantasy…from a science fiction movie,” he said through a translator. The media circus gave Trump a prime opportunity to once more boost the brand he has spent a lifetime cultivating. At his press conference, Trump repeatedly boasted about his dealmaking ability. Asked about concerns the Kim regime had misled nuclear negotiators in the past, Trump touted his intuition. Trump cast himself as a forward-looking leader who would end the uneasy stalemate that has governed the region since the end of the Korean War. “This should have been done years ago, this should have been resolved years ago. But we’re resolving it now,” Trump said, referencing efforts by previous presidents, including the Agreed Framework signed in 1994 and the six-nation talks that began nine years later, after the failure of the first effort. Both sought to end North Korea’s nuclear program, without success. “We’re prepared to start a new history, and we’re ready to write a new chapter between our nations,” Trump said. He also promised the process would continue to move forward quickly though he didn’t outline an exact timetable. The proceedings were broadcast through the night by American cable news channels. Perhaps the only place where Trump’s meeting with Kim wasn’t watched live was North Korea. That country’s state television was not scheduled to go on until Tuesday afternoon and was airing a colored bar test pattern as Kim spoke with Trump. Trump clearly enjoyed the attention to talks that he viewed as a triumph of unrivaled proportions. Clearly comfortable at the press conference, he questions for more than an hour and joked with the same reporters he has sometimes denounced as disloyal members of a “fake news” media. “It’s an honor to be with everybody today, the media. It’s a big gathering of media. I will say makes me feel very uncomfortable, but it is what it is,” Trump quipped. Before taking a question he urged CNN’s Jim Acosta, one of his favored targets, to “be nice.” He praised the conservative One America News Network as “really beautiful.” There were allusions to the Staten Island ferry, as well as to an uncle who’d been a professor at the Massachusetts Institute of Technology. As for the president himself, he was elated, but also exhausted.